The Global Sociology Blog is located on my blogroll at A Bit More Detail, and a regular read with its sharp and acerbic comments on the world as it relates to the social sciences. Yesterday, the author reacted to Robert Kunzig's National Geographic article "7 Billion" and associated video, by observing that "population does not grow homogeneously but largely in the periphery." As illustration, it's map time. 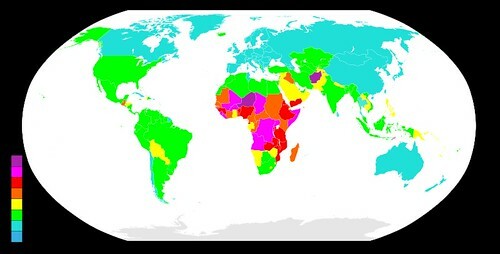 Originally found here, this map ranks the countries of the world according to total fertility rate over 2005-2010. 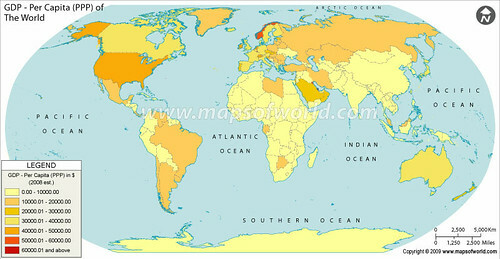 Originally found here, this map ranks the countries of the world by their 2008 GDP per capita at purchasing-power parity. Originally found here, this map ranks the countries of the world according to the United Nations' Human Development Index. As Kunzig observes in his article, decisions on fertility are product of any number of cultural elements, from the relative autonomy of women to the structure of economics to relationships with the divine. It may almost be clichéd to suggest that human and economic development are contingent on the sorts of the far-reaching of cultural norms that inevitable produce a four-stage--maybe five-stage--demographic transition. An excellent way to help reduce unwanted fertility, I'd argue, would be to help those countries disconnected from the world economy and in desperate need of health and education services for those populations to fill those needs. As for the impact of the environment, the Global Sociology Blog's author went on to notice, population growth in peripheral countries doesn't have nearly the same effect as overconsumption (more regular consumption also, I'd add) in core and semiperipheral countries. It's not so much the quantity of people as the quality of their consumption that will determine the fate of the natural environment, in other words. From a cartography perspective, all three maps demonstrate really poor choices of color. Look again. The GDP colors are the worst.